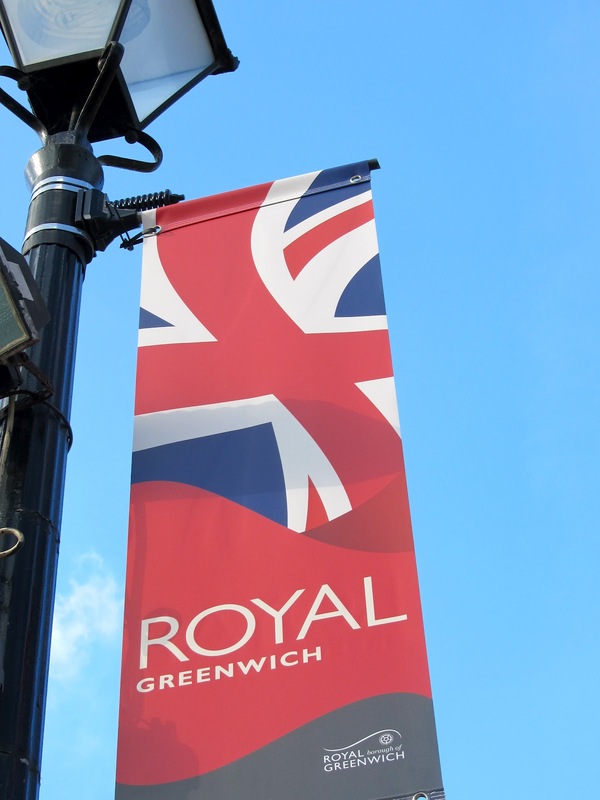 Due to its historic roots with the Royal family, and to mark the upcoming Diamond Jubilee, the Borough of Greenwich has recently been appointed a new title. The Royal Borough of Greenwich. So I thought this green and pleasant part of London deserved a little blog post of its own. Luckily for me it's only a short stroll from home, so stroll I did on a recent ridiculously balmy spring day. When you're in Greenwich, it doesn't feel like London any more (or Kansas for that matter). It's so pretty, leafy and green, green, green! There's a gorgeous large park where not only can you wind your way up to the Royal Observatory, the home of Greenwich Meantime and stand on the line, but also frolic in the grass, collect conkers, picnic under the trees and admire the far reaching views over the the Royal Naval College, the Maritime Museum, St Paul's Cathedral, the O2 arena, Canary Wharf and the city beyond. Before rolling all the way downhill again! And for the horse lovers amongst you, Greenwich Park will be hosting the equestrian events for this year's London 2012 Olympic Games. There's also the Thames foot tunnel where you can literally walk under the river in around 6 minutes flat. The wonderful Cutty Sark (the world's only remaining Tea Clipper) is a big local highlight and has just been resurrected to its former glory following a terrible fire and will be relaunching ready to meet its public next month. Maybe in time for the London Marathon on 22nd April where the Cutty Sark is one of the most memorable landmarks of the course. Aside from all the history and grandeur of Greenwich, there are lots of quirky and cultural things to be found. For those who like film and theatre, there's The Greenwich Playhouse and the Greenwich Theatre, both of which put on some excellent productions. Then there's the Greenwich Picturehouse, a great cinema with comfy seats and a bar. And a visit to Greenwich wouldn't be complete without a visit to Greenwich Market which has been around since the 1960's. This covered market sells everything from vintage collectibles, antiques, crafts, jewellery, clothes and art, as well as a diverse selection of world food. And not forgetting the open air market too just along from the cinema, which is more of a flea market selling curious odds, sods and bric-a-brac. Always good for a rummage and a bargain. And if fans are your thing (as in in cooling, not screaming), then why not venture to The Fan Museum, the world's only museum dedicated entirely to fans. Located in a lovely old house, the museum is home to a collection of over 3,500 fans, dating back as far as the 11th century. And when you're all fanned out, why not take tea in The Orangery overlooking a secret fan-inspired garden which is literally an oasis of tranquility. 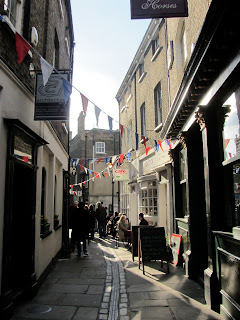 Just across from the Fan Museum is a newsagent. Nothing unusual about that, except if you look closely in the small ads on offer in the window, you'll see a few funny ones such as 'For sale: parachute, used once, unopened'. It's enough to make you titter. As I walked down towards the market, I happened upon a Pearly King cab driver with his button-embellished pearly black cab. With songs blasting from his speakers, he was chivvying up the locals (and tourists of course) with his renditions of good old Cockney classics such as Knees Up Mother Brown and Any Old Iron. I ended up walking all the way to the river with I've Got A Lovely Pair Of Coconuts stuck in my head! There are a multitude of fantastic places to eat and drink in Greenwich, but my favourite pub is the Trafalgar Tavern, a fabulous historic old pub situated on the edge of the Thames with stunning views over the river. Charles Dickens no doubt enjoyed a pint of mead here back in the day. And not only is it a great watering hole, but it does excellent food too. And once you've decided it's time to bid Greenwich farewell, what better way to leave than via the Thames Clipper which zooms you along the Thames back to the heart of London, leaving beautiful Greenwich in its wake.